Two of the world’s most recognisable icons are coming together April 16-17 as the all-new Ford Mustang will be on display on the observation deck of the Empire State Building in New York. The display – replicating the same feat from nearly 50 years ago – coincides with the global celebration of 50 years since Mustang debuted at the 1964 World’s Fair in New York. 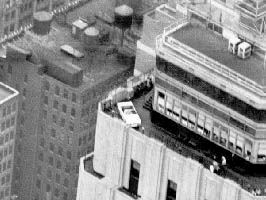 Taking a car 86 stories above the densely populated streets of Midtown Manhattan is no simple task. No portable crane can reach the 86th floor observatory, and the spire towering above the relatively narrow deck makes helicopter delivery impossible. That leaves the elevators as the only viable option. When the Empire State Building opened in 1931 as the world’s then-tallest building – a title it held for nearly 40 years – no one would have envisioned trying to transport a car up in the original elevators. But in 1965, a prototype Mustang convertible was sliced into three main sections plus windshield so that the sections would fit into those elevators. In Ireland, President of the Great American Steel Car Club (GASCC), Jason O’Driscoll, reckons there are upwards of 300 Mustang models in Ireland that have been brought into the country over the years. “Mustang is the most iconic of the American muscle cars and it is the most sought after nameplate today. Mustang established the concept of the movie car chase when Steve McQueen’s 1968 Fastback model was featured in ‘Bullitt’ ”, said O’Driscoll. That starring role in ‘Bullitt’ was just one of more than 3,000 film and TV show appearances for Mustang which made it Hollywood’s favourite car. Indeed, the film appearances have continued right up to today with the 2015 Mustang starring in the recent Need For Speed movie that is on current release. The GASCC has a membership of over 100 car enthusiasts mostly spread through the Munster area. There are 15 Mustang owners in the club. The club’s Mustangs and all other models will be on display at the club’s fifth annual Rock ‘n Rumble American Car, Truck and Bike Show which takes place at Cork Constitution RFC, Ballintemple, on Saturday June 7. The new Mustang is the most advanced version yet of the iconic car and goes on sale in Europe in 2015. The sleek new design of Mustang fastback and convertible is backed up by world-class performance from a range of available engines, including an all-new turbocharged 2.3-litre EcoBoost and a 5.0-litre V8 with more than 426 PS. Commenting on the prospect of new Mustang being available from local Ford Dealers next year, O’Driscoll said: “Anyone who appreciates the classic models from the 60s and 70s has to be excited about the chance of driving the new Ford Mustang. We were delighted to see the new design holds true to the classic Mustang look and the key question is: will the drive be as exhilarating?”. Ford Mustang was revealed to the world with a television advertising campaign on the evening of April 16, 1964, before being shown to the public at the New York World’s Fair on April 17. The car officially went on sale that day, and Ford dealers accumulated a record 22,000 sales and orders that first day on the way to more than 418,000 sales in the first year and 1 million sales in less than two years. Over the past five decades, more than 9 million Mustangs have been sold.